"...I contend that we are both atheists. I just believe in one fewer god than you do. When you understand why you dismiss all the other possible gods, you will understand why I dismiss yours." Weak atheism (also known as agnosticism) suggests that we have no evidence whether or not god exists. It is characterised by the phrase "I do not believe god exists". It's not a belief as such, any more than stating "I do not believe you have blond hair" is a statement of belief about someone you have never met. Strong atheism (or just atheism) suggests that the evidence we have is that god does not exist. It is characterised by the phrase "I believe god does not exist". As such, it is a belief, but usually one taken after a due consideration of available evidence. I can with some confidence say "I believe you do not have naturally purple hair" of someone I have never met. I'm a strong atheist in that I believe that god does not exist. Beyond that, I am of the opinion that religion at best fosters a sense of community, and at worst is one of the most dangerous things on the planet. In that case, you may think of me as an antitheist - one who is opposed to religion. You might also wish to look at the alt.atheism FAQ which clarifies many long-worn areas of discussion. It is, in principal, impossible to conclusively prove the non-existence of something. It could be somewhere you haven't looked, or you could be looking for it in the wrong way. Just because I've never met anyone with naturally purple hair, doesn't necessarily mean that no such person exists. This is certainly the case with god, as with anything else. In fact, this is even more difficult with god, because he could do sneaky tricks like generating the entire Universe 3 seconds ago, making it look like it was 15 billion years old. The trouble is, that as you look in more and more places, with more and more different instruments, and still fail to find evidence, the likelyhood of an object's existence becomes very small indeed. Furthermore, given the magnitude of power that god is supposed to be able to wield, surely we should see something which cannot otherwise be explained. Many people see the origin of life as something which requires a creator of some sort. I am not one of them. Once you grasp the simple premise behind evolution ("Survivors survive"), then life, complexity and intelligence are all downhill from there. In fact, there is a whole newsgroup devoted to this question: talk.origins. It's pretty busy, and there's a lot of low-quality posting, but there are occasional good arguments. 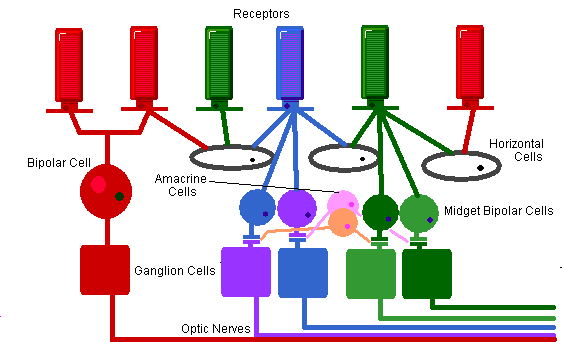 As you can see, there is a layer of light receptors (the rods and cones), and some connection and processing cells connected to them. The optic nerves are very long and connect the receptors to the brain. This seems a sensible enough arrangement until you realise that the light in this diagram shines in from below. It has to negotiate all the ganglion cells, optic nerves, and so on before it gets to the receptors. Another consequence of this is that the optic nerves have somehow to get out of the eye; they are on the inside. Where they do this is the blind spot - they all gather together on the front of the eye before exiting through the retina itself. This is a perfectly plausible result of the early evolution of the vertebrate eye, but no half competent designer would have made it like this. Therefore, I have to conclude that the vertebrate eye was not put together by a half competent designer. The octopus and squid have a very similar eye design to our own, with the major exception that their retinas are the right way out. Perhaps we were created first, then the squid afterward after all the bugs had been ironed out. Or then again perhaps not. This is something extremely close to my heart and related to the evolution debate, above. Scientific literalists attempt to justify a literal interpretation of their chosen scripture using scientific evidence. This evidence is usually spotty at best, and in most cases has been out-and-out refuted by mainstream scientists. In this respect they are like the flat earthers, clinging on to an outdated dogma by more and more wild post hoc rationalisation. Here is a typical example of the literalist worldview: trying to scientifically show that the story of Noah is literally true. This ends up trying to justify the unjustifiable while there's a perfectly obvious explanation within the religious realm of thought. One common question is "Where did the water go after the flood?" They start talking about "vapour canopies" and other unlikely stuff. How about "God magicked it away"? After all, he's omni-everything, he can create the whole universe from nothing, what are a few quintillion tons of water? "Why isn't there any geological evidence for a world-wide flood?" Some will point to a few flood-produced sedimentary rocks (of great age, but then, of course, the dating process must be all wrong...), and try to explain about the incompleteness of the sedimentary record when more widespread evidence is not forthcoming. Why not just let god worry about the details of clearing up afterwards? If he can magic away all the water, he hardly has to worry about a little silt here and there. Next question: "How did the animals get in Noah's ark? There are around 30 million species on Earth. Two of each gives 60 million animals. That's a lot of room, even if most of them are nematodes and beetles." They invoke delayed speciation, reducing the number of animals in the ark to a manageable number. Why bother? God magicked them in. He can do anything. "Why didn't they eat each other then." Noah retrained them, obviously, and then retrained them again to their original habits after they landed. But why not just let god magic the problem away again? No need to retrain them and otherwise fiddle about. "What did they eat on the ark, and what happened to all the dung?" This is an especially good one, for which there are a myriad of different answers. How about this one: God magically fed them with manna or pixie dust or twinkies. Why bother going into a load of irrelevant nonsense about slurry chutes and stuff? But here comes the crunch. If you accept "God did some magic and the problem went away" as an acceptable answer for any question, it becomes acceptable as an answer for all questions. This leads to a bankruptcy of thought that seeks to explain everything and ends up explaining nothing, and more to the point, this is obvious to everyone intelligent enough to understand the question in the first place. Thus, the literalist has to borrow ideas from mainstream science to make things look plausible (sounds like a scriptwrite for The X-Files), even if only under the weakest of examinations. However, it would seem that there are enough people who do only apply the weakest of examinations, to perpetuate the whole futile excercise. Many people seem to think that we are separated from other life forms by the existence of a "soul", which elevates us from being mere machines. If this is the case, then why do chemicals and brain damage have such an effect on our consciousness? It seems to me that the evidence is that minds are what brains do, in the same way that calculations are what calculators do. No-one suggests that the numbers in a calculator have any supernatural part, so why do so for our mind? Many religions believe in an omnibenevolent god. Given this premise, it is very strange that nasty things happen to people. A lot of this can be rationalised as free will, but the continued existence of earthquakes, floods and accidents sidesteps this objection. If a supposed creator still loves us (whatever that means), how come so many of us are killed in natural disasters which the creator could easily have avoided creating? The obvious conclusion is that these accidental disasters are just that, and are not directed. Or prevented, which invalidates the original premise rather. Organised religions can provide a sense of community and belonging, and do a great deal of good work, but this is often balanced by an insularity and rejection of others which has caused more conflict than anything else apart from land. Again, this can be viewed as an evolutionary trait, this time in the space of ideas. The most popular organised religion has as its first commandment "Thou shalt have no other God but me." If people who defect or are outside this belief system are persecuted, the central ideas become self- fulfilling prophecies. The most negative parts of most organised religions are the ideas of infinite prolonged retribution and torture if the central tenets of the religion are not obeyed. This can easily lead to overwhelming fear which quite overshadows anything else in life. Viewed 12655 times since 2007-01-19. Copyright ©2006-2014 Sean Ellis. All rights reserved. Hosted by Kernow Web Hosting.